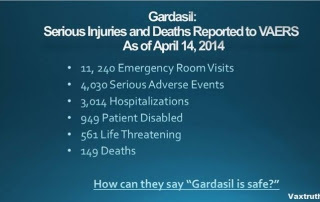 Is the Gardasil Vaccine Killing 1 out of every 733 Healthy Adolescents? Have you heard about the new diagnostic criteria? It’s called Sudden Adolescent/Adult Death Syndrome (SAADS). Just like Sudden Infant Death Syndrome (SIDS), SAADS frequently occurs within a few hours or a few days of vaccination. This is taken directly from the vaccine manufacturer’s insert for Gardasil: “Across the clinical studies, 40 deaths (GARDASIL N = 21 or 0.1%; placebo N = 19 or 0.1%) were reported in 29,323 (GARDASIL N = 15,706; AAHS control N = 13,023, saline placebo N = 594) individuals (9- through 45-year-old girls and women; and 9- through 26-year-old boys and men). The events reported were consistent with events expected in healthy adolescent and adult populations.” 40 deaths out of 29,323 study participants is 1 death for every 733 subjects. Merck wants you to believe this is normal and “consistent” with what is “expected in healthy adolescent and adult populations.” In what universe does 1 out of every 733 healthy adolescents and young adults suddenly drop dead? Wow, you are so “on it” with these important updates. Thank you! With a friend who is being hounded by the Kaiser system to have his daughters (12 & 15) come back in to finish the Gardasil series, this is by officious letter about every two weeks. After learning of their initial exposure, I’ve alerted him to the risk if not outright danger and only mention this other…because such intense follow-up does reveal how important this next blockbuster (highly profitable) drug (after dismal failure, heart attacks, deaths of Vioxx) is for both the provider who has bought inventory and even as we know from one of the clinical investigators of the vaccine, Dr. Diane M. Harper…the fast tracked deception of Merck. Unfortunately, since the ex-wife is an RN, my friend has been having a hard time convincing her that Gardasil could be dangerous…and now I will forward him this latest for all the more reason why she must be courageous enough to think outside the inherently self-serving box of her pharma-funded training to best protect their children. Years ago, my mom died in her 40’s from Cervical cancer and for darned sure, as is based on all the research I’ve done to find out why so as to better protect myself and my own children, it had absolutely NOTHING to do with the fact there was no vaccine for it. As Louis Pasteur astutely said on his death bed, “It’s not the germ, it’s the soil”…meaning that when looking for origin of cancer, it is more about the surrounding environment (both within and without, i.e. internal exposure or malfunction, lifestyle choices) that fuels the agitation of cellular imbalance or, is not related to the specificity of genetic propensity. Thanks again for all the greater good you extend to others. Believe me, it matters.